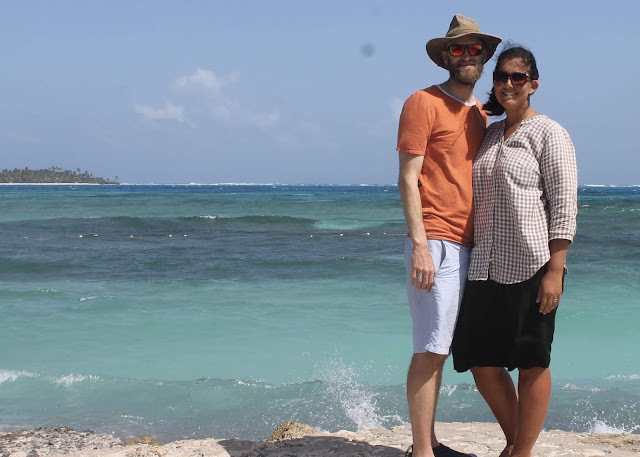 Most of our overseas homes have been pretty far from any coastline, so when we learned our next assignment would be Colombia, which has both Pacific AND Caribbean coasts, I was overjoyed. And then when I learned that Colombia has an archipelago in the Caribbean Sea, I told my husband that we were going there. And I started planning our trip to San Andres Island - my first trip ever to the Caribbean. 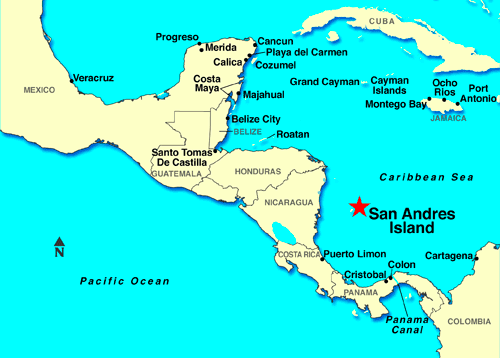 San Andres is a tiny, 10 square mile island off the coast of Nicaragua. It's the largest island in the archipelago, is shaped like a seahorse and is protected by a 20-mile long barrier reef. Although it now belongs to Colombia, the locals are a mix: descendants of English settlers, African slaves and mainland Colombians. The island is surrounded by what's known as the Sea of Seven Colors - this name was actually used as far back as the 17th century by pirates and smugglers. San Andres continues to be a smuggling waypoint, to get drugs from mainland Colombia to Central America. The whitecaps indicate the barrier reef. The northeastern tip of the island - the seahorse's snout - is visible in the photo. We went for five nights in January and had a fantastic time. The sea really does have (at least) seven colors, thanks to immense shallow pools of sparkling light turquoise, darker greener patches where sea grass grows, darker blue where the coral is, and deep deep blue beyond the barrier reef. It is absolutely stunning in person. The island is small enough that you can drive all the way around it in less than two hours, which we did on our second night there. We didn't stay in the main town, which is quite crowded and touristy, but in a smaller, quiet neighborhood on the island's east coast, in the belly of the seahorse. We rented an apartment in a house that was right on the not-too-crowded Rocky Cay beach, and enjoyed swimming and snorkeling and just hanging out. It.was.awesome. 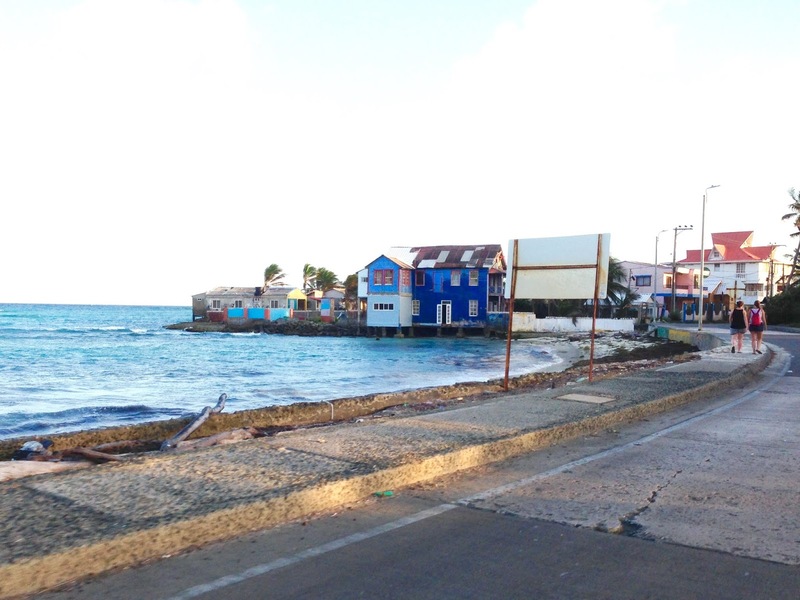 Driving through the town of San Luis, San Andres Island. But you're not here for a travel report, are you? Thankfully, I have some more vacation-related sewing to show off, though I had to retake the photos when we got home since the ones I took on the beach didn't show the skirt that well. I consider a black skirt to be a wardrobe staple, and when I bought my clothes, I always had at least two in my closet. 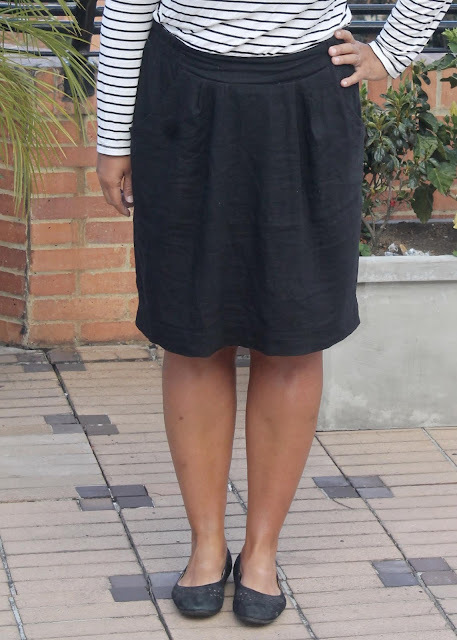 But for awhile now, my only black skirt has been a ponte pencil skirt that I sewed nearly four years ago, and which has the pills to prove it (note to self: sew a new black knit pencil skirt). So I took the opportunity of the pre-vacation sewjo surge to whip up a quick Simplicity 1887. I used the black linen that I had leftover from a Portfolio dress. I sewed two skirts and four pairs of shorts from this pattern in 2016. They still constitute the backbone of my summer wardrobe, though several of the pieces are looking a bit the worse for wear. I sewed the size 16 again (my pattern size is a 20; this pattern has insane amounts of ease), but I unlike the last two times I made this skirt, I didn't make any alterations to the side seams; I just sewed them with a 5/8" allowance. I did add 2.5" in length so that I could take a 2" hem. I had thought about making some fancy rows of topstitching at the hem in a gold or yellow thread, but decided at the last minute to keep it simple so that it would go with everything. I somehow lost half the instructions in the pattern. So I pulled out one of the other skirts I had made in 2016 to remind myself how to do the elastic in the waistband and it worked perfectly the first time. Not much else to say about a pattern I just sewed for the seventh time, so I'll leave it at that. As always, thanks for reading, and see you next time! I bought that pattern largely on your recommendation a few summers ago, and haven't made it up yet! I think that needs to be my next skirt project when I'm ready to come out of my blanket-style winter skirts. I'm looking for just that sort of silhouette right now--super cute! I have only made it in linen, but it shines in that fabric :) Looking forward to seeing what you make of it! 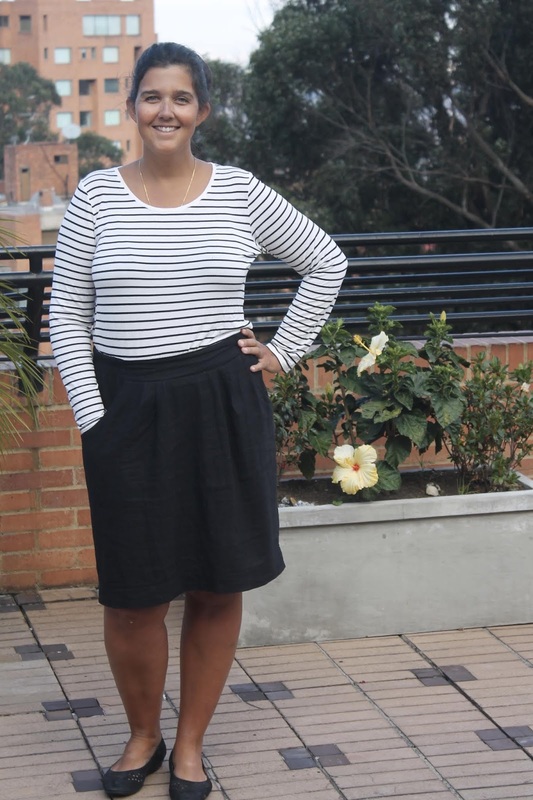 that skirt looks really cute with the striped top - and what lovely beachy photos, thanks for sharing! "But you're not here for a travel report, are you?" The sewing is good too. Haha. 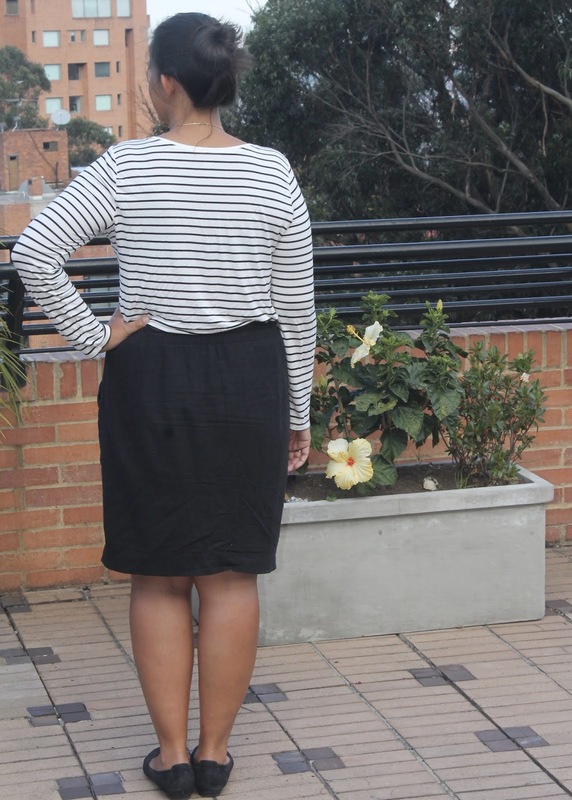 Love your skirt. I currently have 2 black skirts that I wear regularly. They really do go with almost anything. The Caribbean sea is my favourite place to travel down south, the turquoise green ocean is so beautiful! If you like snorkelling, you might look into the island of Bonaire which is not far from Colombia. You can purchase online a map of snorkelling points and travel around the island snorkelling right from the beaches. Great place to go for around 5 days (you do need to rent a car). Oh, there are so many beautiful places to visit around there: Cuba, Panama, Jamaica, the Turquoise Islands..................Lucky you for living so close to paradise! Very nice pics and cannot go wrong with a black skirt!